From my perspective, Lytro.com as a domain name doesn’t have a whole lot of meaning that I can see, so I was curious about what could be causing the substantial interest in the domain name. Despite its substantial funding, it would appear that things did not work out well for the company, according to a March article published on PCMag.com. “Lytro, the photography startup best known for its “shoot first, focus later” camera, has announced it is shutting down,” it was reported in the article. That article referenced a TechCrunch report of a rumored acquisition by Google, but I am not sure if that happened. An article published on The Verge offered additional details about the company. Whatever the case is, it looks like the domain name is now in auction. The auction for Lytro.com ends just before 3pm Eastern today, unless last minute bidding extends the close of the auction. Because the domain name is registered at Name.com rather than at GoDaddy, I am not sure how much additional time is given for someone to renew the domain name prior to its provisioning. This explains the bidding war. Parking isnt dead yet. It’s just an entirely different game than it once was with direct traffic. 41k for 5 letter brandable? Is this a new trend or did I miss something? Did you even read the article? Did you Google this 5 letter brandable? It has it’s own Wikipedia page. Come on we are nearing $50K, I have better has been names, who are these clowns bidding? Do you realize this domain has backlinks from AAA-class media (e.g. CNET)? Just a single link like that costs more than 50k. Wonder what happened to that $215 million in funding, did they burn through it all? Ouch. And only had a made up pronounceable five letter domain to show for it. 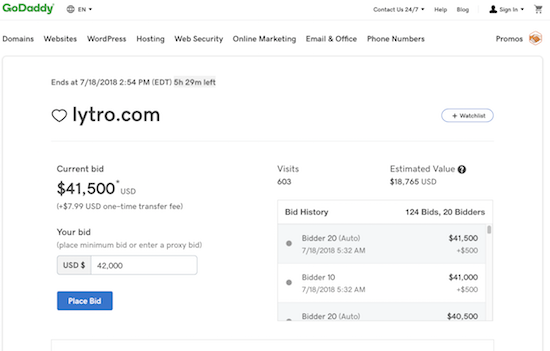 Wonder if parking the domain on a page full of photo site ads will pay back the auction winner’s price, I guess that’s what they’re betting on.